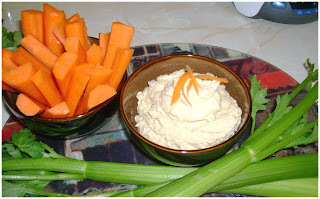 I've been making hummus for a while, and for anyone who makes it, you know you can play around with the recipe a lot. Anyway, I stumbled onto this recipe from vegweb.com and it really is the best I've ever made. It uses a good amount of garlic, which I happen to prefer. I recently made it to bring to a party- the strong garlic made it everyone else's favorite too. Of course, you can adjust that to your taste too. That night I used all 5 cloves- today I did 4 and it was a little less intimidating. The secret to this recipe being so yummy is making an emulsion of the tahini in a water based liquid first. Just throwing everything together in a blender won't do this. First put the tahini and lemon juice into a blender and blend away until it's frothy, white, and creamy. You can also add a little warm water- less than a quarter cup. Mince the garlic and blend it into the tahini cream and add salt to taste. I rinse the chickpeas before slowly adding them- some recipes call to use the liquor from the can, but I don't love that taste. Blend a handful of chickpeas into the tahini cream until it's smooth. Add salt to taste and maybe a little more water if you like your hummus slightly thinner. You may even experiment and not use the whole can of chickpeas- some make this recipe using half the can. Drizzle a little of the olive oil in while it's blending. You can get away with using none, or some people use more. Experiment! Some people also advocate heating up the chickpeas first before blending them, it might make them blend a little easier. My food processor doesn't require this, but a less powerful one might. 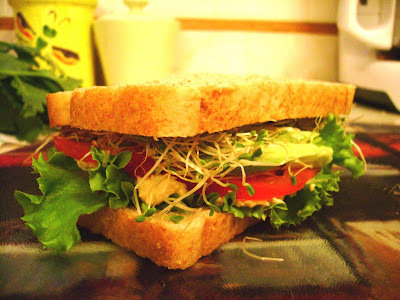 This is Matt's all-time favorite sandwich- fresh hummus, whole wheat bread, sprouts, avocado, tomato and lettuce. Yum!